It’s the second time this year the president has taken to Twitter to urge the cartel to backtrack on its current policy of cutting production. Unlike last year, when Trump’s attacks triggered a swift U-turn in Saudi oil policy, the group has so far ignored his calls. Oil prices showed limited reaction on Thursday morning, briefly dipping about 35 cents before ultimately rising above yesterday’s close alongside U.S. equity markets. West Texas Intermediate, the U.S. crude benchmark, has climbed 30 percent since the Organization of Petroleum Exporting Countries and allies including Russia began another round of production cuts at the start of the year. Average American gasoline prices are at a four-month high, heightening concerns about the impact of the cartel’s policy on the nation’s consumers. "The tweets seem to have diminishing returns these days,” said Derek Brower, a director at RS Energy Group. “Everything Saudi Arabia is doing right now suggests it will not be bounced into prematurely ending its cuts this year." 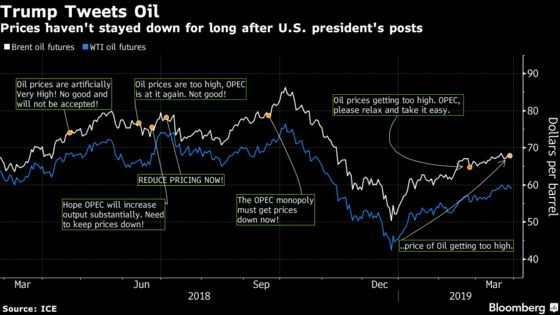 Earlier this month, Saudi Arabia led the Organization of Petroleum Exporting Countries and their allies to reaffirm their commitment to output cuts, but conceded they should defer until June the decision on whether to extend the curbs. Separately, the U.S. State Department confirmed Thursday that it has raised concerns about Venezuela’s Manuel Quevedo serving as president of OPEC. Venezuela’s oil minister holds the rotating presidency this year. Last month, he was sanctioned by the U.S. Treasury Department for his ties to President Nicolas Maduro. Trump’s desire for low fuel prices cuts both ways since the shale boom turned the U.S. into the world’s largest crude producer. The country’s output has exceeded 12 million barrels a day since mid-February, yet there are already signs that growth is slowing. The number of operational drilling rigs has fallen for five straight weeks to the lowest since April, according to data from Baker Hughes.